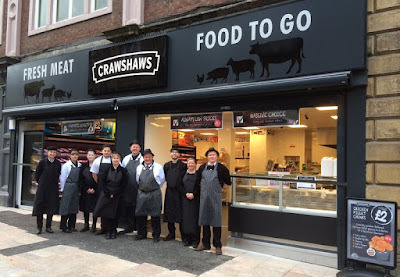 Crawshaw Group PLC, the Rotherham-based fresh meat and food to go retailer, has reported sales of £37.1m as it implements an accelerated store expansion strategy. Last year, the AIM-listed Hellaby firm announced details of its growth plans that will see it invest £200m, opening 200 stores and creating 2,500 jobs. Crawshaws described the year ending January 31 2016 as a "transformative year" with a new management team and the appropriate infrastructure in place to deliver the rapid growth plan. Reporting its full year results, Crawshaws saw turnover increase by 51% to £37.1m compared to the £24.6m in the previous year. Opening 17 new stores, the investment for accelerated expansion meant that a loss before tax of £0.3m was reported which compares to the profit before tax of £1.2m in the previous 12 months. However, a 45% increase in adjusted earnings before tax was reported as strong sales growth is being converted into strong profit growth. Margins had also increased slightly and like for like sales were up by 1.8% for the full year. Noel Collett, chief executive officer at Crawshaw Group plc, said: "We are pleased to report another set of solid results for the business and are delighted with the significant progress we've made during a very transformative year. We have proved that customers love our compelling retail concept, delivering quality fresh meat and food-to-go at exceptional prices. With strong foundations now in place, we are well positioned to build on our current position and establish Crawshaws as a national brand." Expanding outside its traditional Yorkshire and Humberside base 15 new stores are set to open in the current year. The latest openings include Blackburn, Widnes, Warrington, Cannock, West Bromwich and Leicester. Richard Rose, chairman of Crawshaw Group plc, said: "Our model continues to perform well. The business is at a very exciting stage with the strengthening of the legacy estate supplemented by the addition of a rapidly expanding new store estate. The newly opened stores are trading well, and profitably, in line with our expectation. The business is in great shape to deliver the planned scale rollout at pace and we have a strong pipeline of stores for 2016, so we look forward to reporting on our progress during the year ahead." Shares in the business were trading for 5p in 2013, now they are trading for 85p. A final dividend for the year of 0.47 pence per share is proposed.